Martha Braun has been painting most of her life and continues to find it not only stimulating and challenging, but a part of her being. She strives with each new painting to realize a fuller potential from herself and the work. Braun has studied and been influenced by the abstract expressionist painters from the movement in the 1950s and before. Artists such as Hoffman, Rothko, Motherwell, Mitchell, and others on the East coast primarily. Her strongest influence has been Richard Diebenkorn and the works he did in California andthen New Mexico. Braun has degrees from the University of Wisconsin, Madison, in Architectural Interior Design and Art. She practiced interior design as a professional member of ASID, in San Francisco, California for 25 years, owning her own design firm in that area. When she retired in 2000, her family moved to Santa Fe, New Mexico where Braun began painting full time and studying with an established abstract painter. Over the years, Martha Braun believes she has found herself in her art and while she will always experiment, as is the case with all great painters, she now feels at home with the evolution of her work. Through the many years she worked as an interior designer, surrounded with color, texture and composition involving the challenge of creating beauty and excitement by combining those elements, this has sharpened her senses and has influenced how she paints today. Since she paints in layers using glazes and handmade papers along with the paint and other mediums, Braun is constantly concerned with how these elements interact with one another in much the same way as when she was designing a house. She's always questioning if the elements of the painting are working together and if they are not! Martha Braun's recent body of work, "Under Construction", grew out of an idea based on her previous experiences working with architectural plans while practicing design and construction in California. It is, she believes, a unique combination; embedding architectural plans into a painting, an idea which she intends to pursue further. Painter: self -taught , painting professionally for 14 years. Mixed media and acrylic on canvas and board. 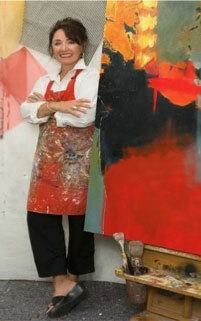 Began painting career after retiring from Interior Design at Age 50.